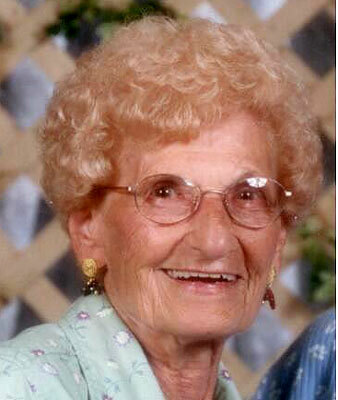 ANN N. BONACKER LAKE MILTON - Ann N. Bonacker, 93, died peacefully of natural causes, at her daughter’s home on April 3, 2016. Ms. Bonacker was born Oct. 6, 1922, in Youngstown, a daughter of Maria and Guy Sorrentino. As a longtime area resident, Ms. Bonacker previously worked at Liberty Manufacturing and Photogenic, where she worked until retirement. Her husband, William E., preceded her in death on Sept. 29, 1985. Ann loved cooking for the neighborhood and traveling in her retirement years. Her favorite pastimes included ceramics, crocheting, and puzzles. She was a longtime member of St. Anthony Church. Ann is survived by a sister, Rose (Sam) Lavanty; her three sons and one daughter, Edward (Nancy) Bonacker, William (Debbie) Bonacker, Kenneth (Cindy) Bonacker, and Sharon Bonacker; five grandchildren, Shannon (Doug) Vilkinofsky, Bill Bonacker Jr., Kelly (Mark) Mondora, Daniel (Rachel) Bonacker and David Bailey; six great-grandchildren, Kyle and Matt Vilkinofsky, Nick and Marissa Mondora, and Amelia and Sofia Bonacker; many nieces and nephews; and a very special four-legged companion, Daisy. Her memory will be cherished by her children, grandchildren, and great-grandchildren, whom were left with a lasting impression of her strong values and love. In addition to her husband and parents, she was preceded in death by her three brothers, Victor, Sam, and Tony Sorrentino; and her two sisters, Julie Sorrentino and Adeline Altier. Family and friends will be received on April 6, 2016, from 2 to 4 p.m., at the Schiavone Funeral Home, 1842 Belmont Ave., Youngstown. A short prayer service will follow the calling hours. The family requests that material tributes take the form of donations to Hospice of the Valley, 5190 Market St., Youngstown, OH 44512, for their kindness and support.